Square felt: quadratic felt placemats and placemats from werktat are simple and beautiful. 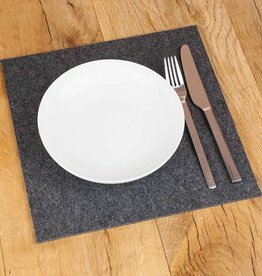 The placemats made of pure wool felt absorb moisture, dry quickly and insulate against heat and cold. The felt placemats can be used on both sides and are ideal for an atmospheric meal and for decoration. Use the felt coasters, for example, as a key tray on the sideboard in your hallway. With the felt placemats you also protect the surface of your glass table in an elegant way: the possibilities are limitless. Our square felt table set is often used on the table in the dining room and prevents your steak knife or ladle from leaving scratches on the table top or plates and glasses from slipping. Visually, felt placemats or middle covers are a great enrichment. In our shop you will find decorative felt placemats in many colours and as a particularly interesting idea there are felt table mats in two-colour versions - as living and decorative accessories they decorate the table, shelf and chest of drawers.